The Lion Safari Camp is a new luxury jungle safari camp at the famous Gir National Park - the last remaining bastion of the Asiatic Lion. It is the first Luxury Jungle Safari Camp of its kind in Gir National Park located in a private Mango Orchard overlooking the Hiran River. The location presently has around 900 Mango Trees with only 2% of the entire land area being built so that the natural setting is maintained. The accommodation consists of 20 Luxury Tents. The tents have large bedrooms with well-appointed ensuite bathrooms with bathtub, shower and hot/cold running water. The public areas of camp consist of an open-air river-facing restaurant. Accommodation This is a premium property consisting of air conditioned luxury tents and is situated just 3 kms from the main Sasan village. The location and the ambience at the camp is just fantastic. The main luxury accommodation is amongst Mango orchards and the restaurant is in an open Patio by the riverside. 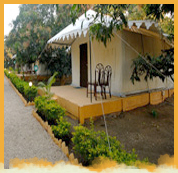 There are a total of 20 tents which can accommodate around 40 persons on twin sharing basis. All the tents are air conditioned with a back up generator. 1 Wildlife Safari at Gir National Park. Above rate will not applicable during X mas, New Year & long weekend period. All Taxes will be extra.